It's the ornament like the one that was hanging on the decorated tree on the American Tobacco Trail in North Carolina! I really liked this ornament - well, the entire tree charmed me, to be honest - and I'm glad I can put it on my own tree now! And now, I just need to actually set up our Christmas tree. I'm telling you, going on vacation right after Thanksgiving sure cuts into prime decorating time...and then I was not feeling well after we came home, so things have fallen by the wayside. Maybe tonight, I'll get that tree started - after all, I have a new ornament to hang! Last week I took Paco to the vet for his annual check up, shots, etc. I've been bringing him in every month for nearly a year so he can get an allergy shot, and they weigh him each time, which is why I was surprised to see that he was down to 26 pounds! He's usually around 28 - 29 pounds, which is a healthy weight for him. I'm hoping the weight loss is a result of us being gone...even though my neighbor took care of him in the mornings and midday, and our "third child" Kevin came over in the evenings and hung out with him, I'm betting that he just didn't eat that much. Paco is not only a social eater, but he's a happy eater as well - like, when we all come home, he runs to his food dish, grabs a mouthful, and then runs to where we are standing, drops the food on the ground, and proceeds to eat it. I being bery quiet under heer, mom. He was nervous here as well, but he looked so happy when the vet tech walked in, and she managed to get this great shot. So Paco always winces when we pet his ears - he's done this for years now. I always have the vet check them, just in case, but there's never anything wrong. Naturally, when I mention to the vet to be sure and check his ears because he's wincing, he discovers a lot of redness and inflammation - albeit deep down and only visible with an otoscope, but STILL. Way to make me look like a bad dog-mom, Paco. He seems to be better now that he's had a super dose of ear medicine, and we've been giving him extra cookies to help with putting some weight back on. If he continues to lose, that wouldn't be a good sign, but he seems to feel good so hopefully he was just on a bit of a hunger strike while we were gone. I had to take my car in for a state-required inspection before I could register her this year (you get a two-year inspection when you buy a new vehicle, which is why I'm finally having to do this - the Duchess is turning two!). Now, usually Jeff takes care of this in the past, but I have gone with him multiple times to complete this boring, mundane task. This time, I was on my own, and I have to say, it was quite a different experience...the guy kept playing with my car, and when he popped the hood, he looked at everything closely, and then looked some more and exclaimed "wow, is that a twin turbo?!" You guys. I love my car, and she has a super speedy mode, but I have no idea if she even has ONE turbo, much less twins! Flashback to December 20, 2014 - such a fun day! I need to get the Duchess into the dealer for HER two-year checkup, but that's not happening before Christmas at this point. Remind me not to acquire pets or vehicles in December - this month is too busy to keep up with things like checkups! Tomorrow we are going to do our longest run of the season - 12 miles. I can guarantee it won't be pretty, seeing as very little running has happened this month so far, but the Houston half marathon is quickly approaching, and we need to get that run in. You can bet there will be some treats happening at Blue Baker afterward! Poor Paco. You aren't a bad mom - ear infections are hard to notice other than by symptoms. I have to tell you what I thought that ornament picture looked like at first glance when I opened your post. I thought it was one of those raised dog food bowl stands with "run" imprinted on the bottom of the bowl, and it was tipped on its side for a picture. I thought "why did Shelley get a run bowl for Paco?". Then I read what it was. Need coffee. Cocoa always sits on my lap at the vet too! Come to think of it, so did Cleo! I can imagine - you have lists, but now you have a LIST. I hope you get some good guidance and a plan for moving forward soon. If anyone isn't a bad dog Mom it's you! These things happen and you took care of it by buying medicine for Paco. It's like I see Bella sitting LOL she is afraid of the vet too. I can't even get her to walk into the examination room. I have to pull or carry her in, she refuses to go. Hope the run goes well tomorrow, at least you know you will have a great and fun breakfast afterwards. Well thanks, Fran - mom guilt, whether dog- or child- is real! Its funny, the dogs I have now mostly get excited to go to the vet's. Poor babies, don't get out much :) Paco's ears--its funny he's been wincing for years, but this was the first time there was an infection. Noah LOVES to have his ears rubbed really hard, so I always think it might be an infection, but the vet says no. Sophie is jealous of Paco's extra cookies. How funny that your dogs get excited for the vet - not Paco, no at all! AWWW! Sweet Paco! Hope the ear meds do wonders and he's back to fighting weight soon! AWWW! Have a great weekend Shelley!!! What fun memories! I love the ornament! Aww, Paco! I hope his ears feel better soon and his appetite gets back to normal. I feel really worried when Data won't eat and seems smaller too. Poor baby! That is awesome you found that ornament! It's cute! 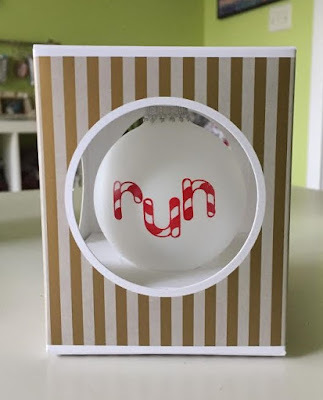 I hope you had time to get your tree up and that your run was okay!